A quinoa and amaranth timbale (a timbale is a savory custard baked in a mold), homemade black beans, a tangerine, and a piece of dried cantaloupe. Beverage: Rice Dream Horchata. Verdict: In a perfect world this meal would include some steamed spinach, but Little shmoo refuses all leafy greens (every child has their limit!). The dried cantaloupe was an interesting new treat from the health food store, very much like dried papaya. And the answer is YES, the timbale DID hold its shape in a seven-year old's swinging lunch box! Amazing! 2 stars for no veggie today. Vegan ham slices rolled up with vegan cream cheese (in the picture it looks like only two, but there are five stacked in there), a pumpkin carob chip muffin, watermelon and cantaloupe balls with organic red grapes, and sweet canned corn. Verdict: Little shmoo had a lot of fun scooping out melon balls and rolling up deli slices this morning. He cleaned it up today, too, eating everything but a bite of corn. 4 stars. 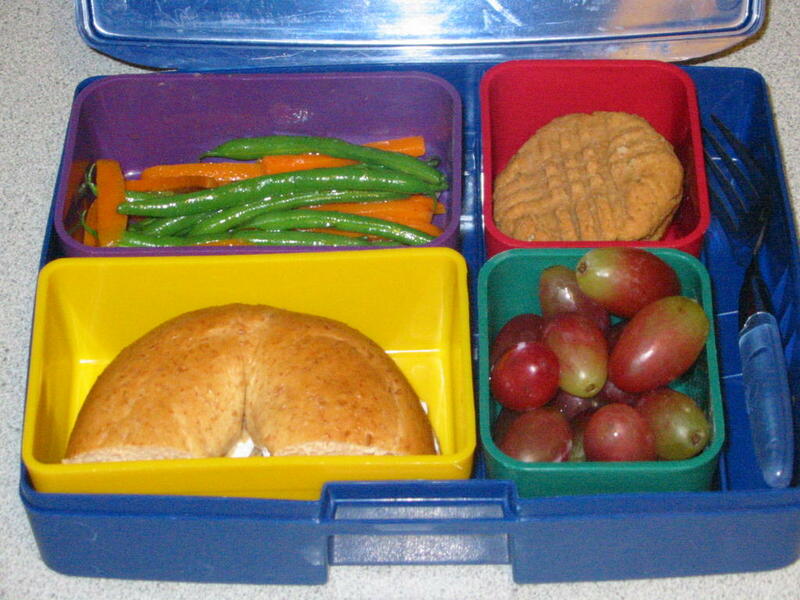 A wholegrain bagel with vegan cream cheese, lightly blanched french green beans and carrots in a tarragon vinaigrette, two nut & seed butter cookies, and some organic red grapes. Verdict: Very quick and easy. Little shmoo said a whole bagel would be too much, but now says a whole bagel will be fine for next time. I wish the nut butter cookies weren't so good -- I'm eating too many! 3 stars. 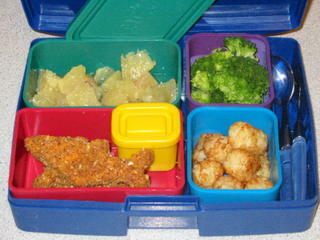 Tofu fishies with a little ketchup to dive into, organic tater tots, lightly steamed broccoli, and grapefruit segments. Verdict: These fishies were nice and crunchy (thanks to my friend Heidi for the recipe!). Everything was "tasty" he tells me, although he's used to his broccoli being piping hot, not tepid. 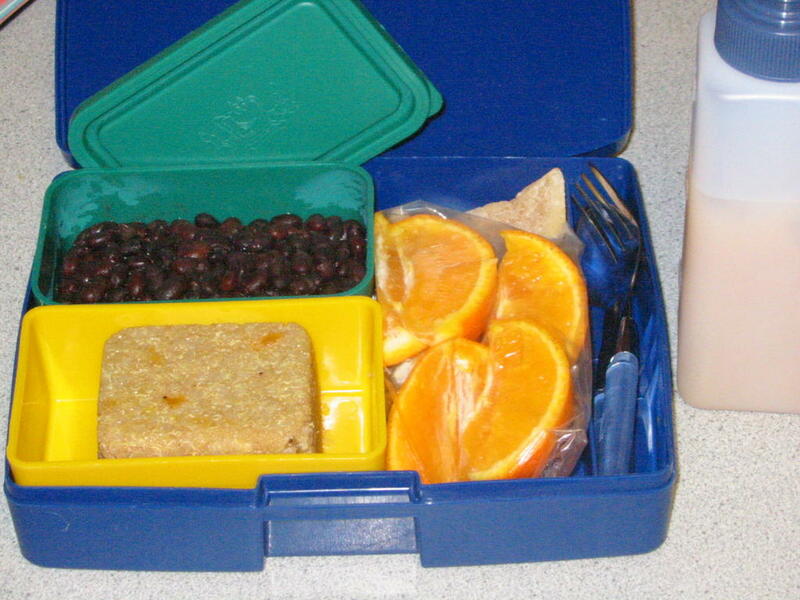 Such are the limitations of the packed lunch. 4 stars. Inari sushi today! 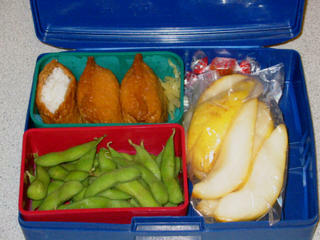 Inari is a sweet fried tofu pouch stuffed with sushi rice. A little pickled ginger is on the side, plus edamame (baby soybeans), an organic pear, and some Botan Rice Candy for a treat. Verdict: Inari is a great sushi to start the kids on if they're not sure about seaweed. Little shmoo says he prefers the nori rolls but he likes these, too. 4 stars. A soy hot dog baked in a dough blanket, with ketchup for dipping. 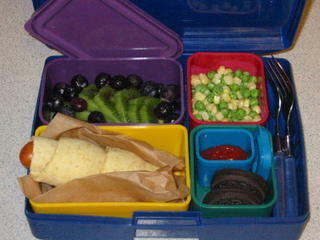 Kiwi & blueberries, peas and corn, and two mint chocolate Newman-O's. Verdict: On Monday someone was asking which vegan hot dogs are the best. Does anyone have a recommendation? Little shmoo loves them all, especially rolled in blankets, but I still haven't found one I like. The frozen blueberries turned the kiwi an unappetizing shade of blue when they thawed -- next time I'm sticking to fresh. 3 stars. It’s what you always suspected we vegans eat, isn’t it? 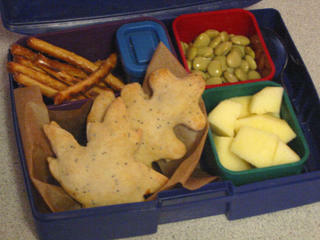 In celebration of the Fall Equinox today, I put together this earthy menu: maple and oak leaves made from a barley poppy seed crust and filled with roasted autumn vegetables. Alongside are pretzel sticks with peanut butter, lima beans, and apple slices. Verdict: I volunteered in the classroom today and got to sit with Little shmoo while he ate. He shared an oak leaf with me and happily ate all the rest. He ate the lima beans first. I love this kid! 5 stars. Creamy cauliflower soup with some smoky pumpkin seeds to sprinkle on top. 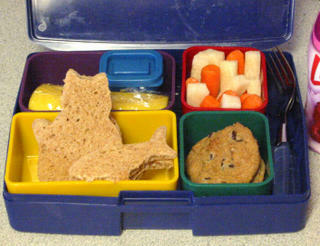 Plus a homemade roll, an orange, and two little gingersnap hearts (from the store -- I can't do everything!). Verdict: I've always felt lucky that Little shmoo loves his brassicas (broccoli and brussel sprouts are his favorites). This is a fantastic soup, filled with cauliflower, potato, and carrots. I was a bit too enthusiastic with the white pepper this time, though, so he only finished half. Still, a good nutritious lunch. 3 stars. One of Little shmoo's favorites today: hot vegetarian baked beans with veggie hot dog bites. 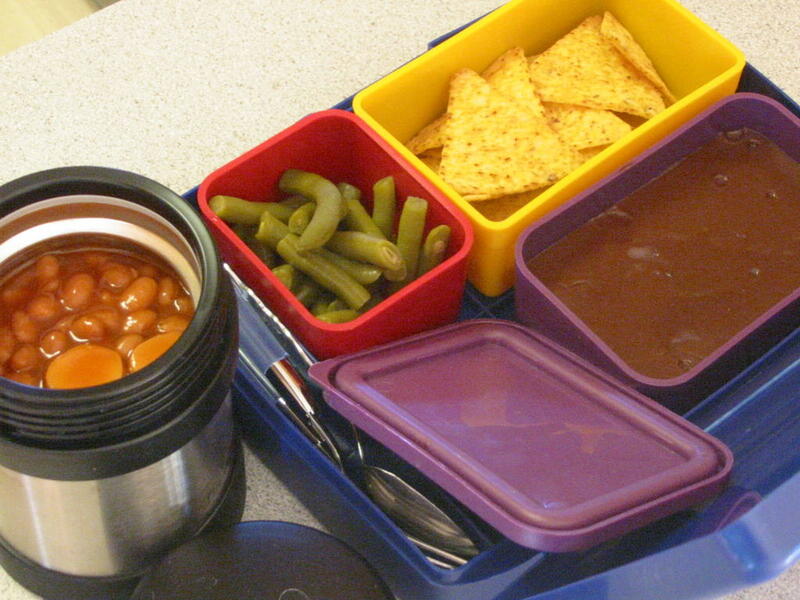 Alongside are green beans, organic tortilla chips, and chocolate banana pudding (he says he'll make an exception to his banana-hating policy if they're covered in pudding!). Verdict: "I liked it!" Hey, what's not to like? Oddly enough, the tortilla chips were the one thing he didn't finish. 4 stars. Could it be? Why, yes! It's...a peanut butter & grape jelly sandwich! Can you believe it? This pb&j is a little kitty cat and with him is his friend Mr. Fish (fish are friends, not food!). 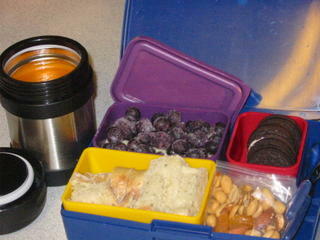 I also packed half a banana, jicama & carrot sticks with vegan ranch dressing, and two chocolate chip cookies. Beverage: Raspberry Silk Alive yogurt drink. 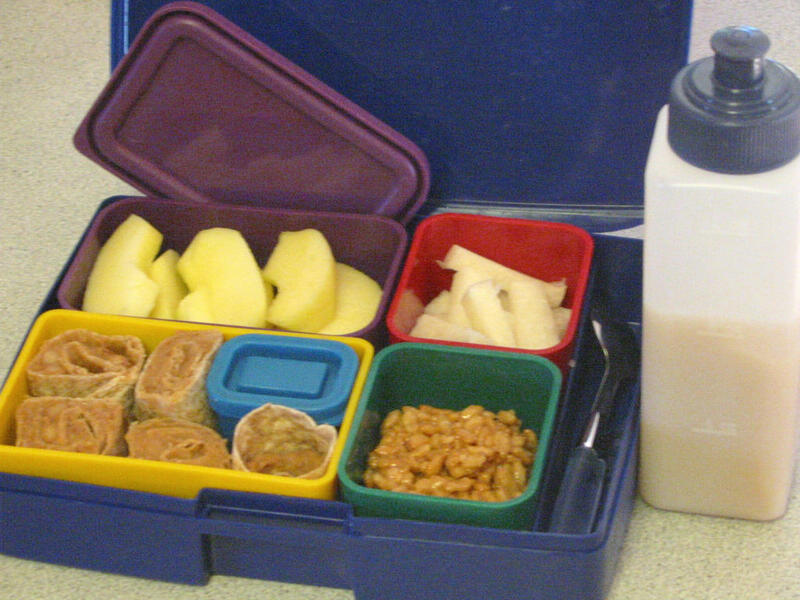 Verdict: A classic lunch box. He ate everything but..."I hate banana," he told me. "Oh. But you eat them at home, don't you?" "I hate them at school." Allllrighty, then. 3 stars. 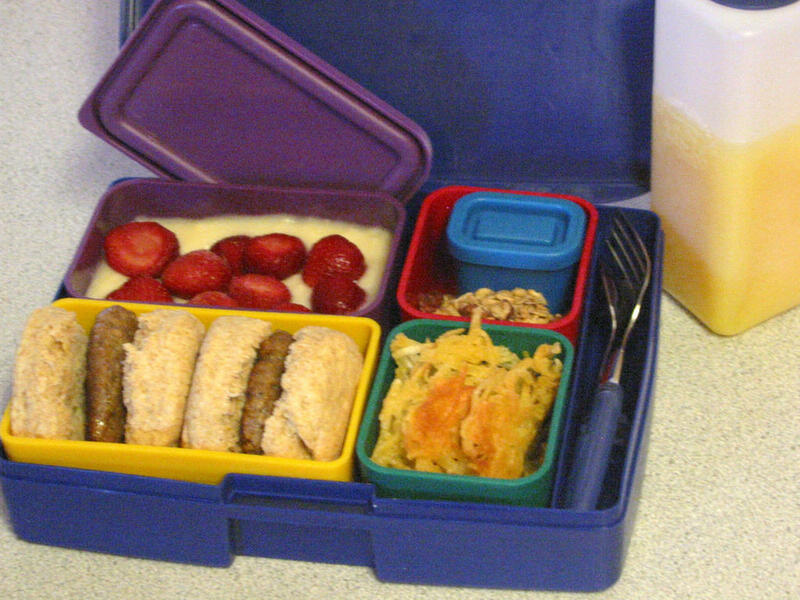 Spelt biscuits with veggie breakfast sausage, hashbrowns, and a little container of ketchup; vanilla soy yogurt topped with frozen strawberries, and some pecan granola on the side to sprinkle on top. Beverage: calcium-fortified orange juice. 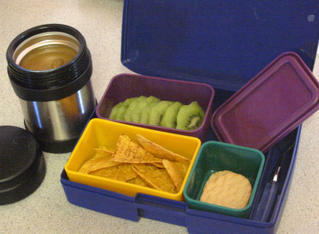 Verdict: Even though I'm crazy about this lunch box, I sure wish one of the small side containers had a lid. I covered the granola with plastic wrap held on with a rubber band so it wouldn't spill. He couldn't quite finish both biscuits -- they're filling! 4 stars. A whole wheat tortilla spread with refried beans, rolled up, and sliced, some salsa for dipping, apple slices, jicama sticks, and a vegan rice crispy square. Beverage: Rice Dream Horchata (cinnamon rice milk). Verdict: Wow, he finished off everything but one little tortilla roll! And we're all addicted to horchata now. 5 stars. A thermos filled with thick, hearty Black Bean Soup, some organic tortilla chips, a kiwi fruit, and two organic lemon poppyseed cookies from the grocery store. Verdict: I think I found the balance with this one -- not too many cookies (one for each hand! ), and enough good food to keep him nice and full until after school. 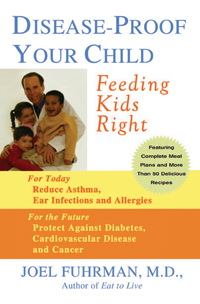 "It's all in my tummy, mom! Can you pack that again tomorrow?" 5 stars. A wholegrain calzone filled with broccoli and tofu "ricotta", a tiny container of tomato sauce for drizzling over bites of calzone, some sweet casaba melon, and one little aplet* for a treat. Verdict: Calzones pack well and are easy to eat with your hands. He loved the filling but not the "crusts" (oh, kids and their crusts!). 4 stars. *Does the rest of the world know about aplets & cotlets or is it a Washington thing? They are powdered sugar-covered soft jelly candies with walnuts -- no gelatin! They remind me of Turkish Delight. 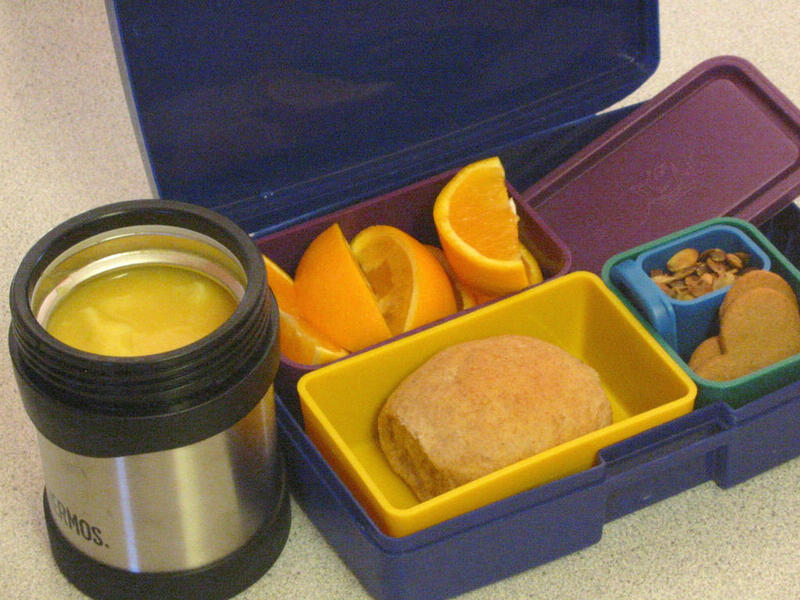 He's been asking to try out his spiffy new thermos, and this morning there was just enough fall in the air to make soup sound good. Roasted tomato basil soup with chunks of potato- rosemary bread for dipping, lemon soy yogurt topped with frozen blueberries, some chocolate mint Newman-O's, and homemade trail mix (peanuts, almonds, sunflower seeds, and dry apricots). Verdict: I felt good about the balance and nutrition in this lunch. But today I learned a hard lesson: four sandwich cookies is too many. "I ate the cookies first," he told me, and I was appalled at how much he had left uneaten. Next time I'm saving some cookies for after school instead. 2 stars for 2 many cookies! Silver dollar pancakes with maple syrup for dipping, vegan breakfast sausage, Creamy Sweet Potatoes with Almond Butter, and fresh raspberries. Beverage: calcium fortified orange juice. He loved the pancakes and sausage, and he tried the sweet potatoes! "Not bad!" he said. This is a great response for him as far as sweet potatoes are concerned. 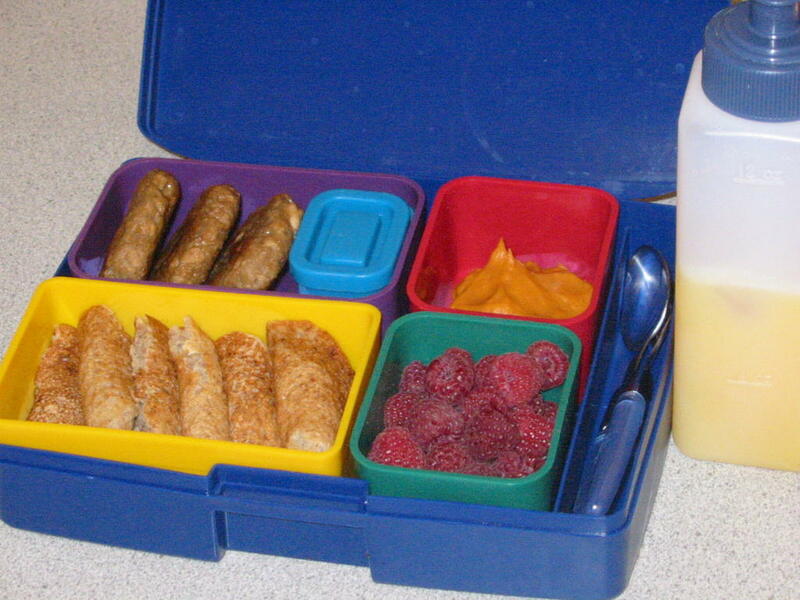 Today we learned that raspberries are too soft to travel well in a lunch box, especially if you are a seven-year-old boy who plays tag before school with your lunch case slung around your shoulder. Oops. 4 stars. Leftover wheat gluten pot roast with carrot gravy, roasted "potato beetles" (peel & cut new potatoes in half and make little slices along the top, then parboil for 5 minutes, brush with olive oil, sprinkle with salt, and roast at 400 for about 35 minutes), green beans, mixed fruit cup, and a chocolate mint Newman-O. Verdict: All my son's favorites. An easy 5 stars. Blackstrap Gingerbread with Lemon Sauce, coconut milk brown rice pudding mixed with ground flaxseed and dotted with pistachios, organic applesauce cup, and a red bartlett pear. Little shmoo had fun this morning cutting shapes out of vegan salami with cookie cutters. 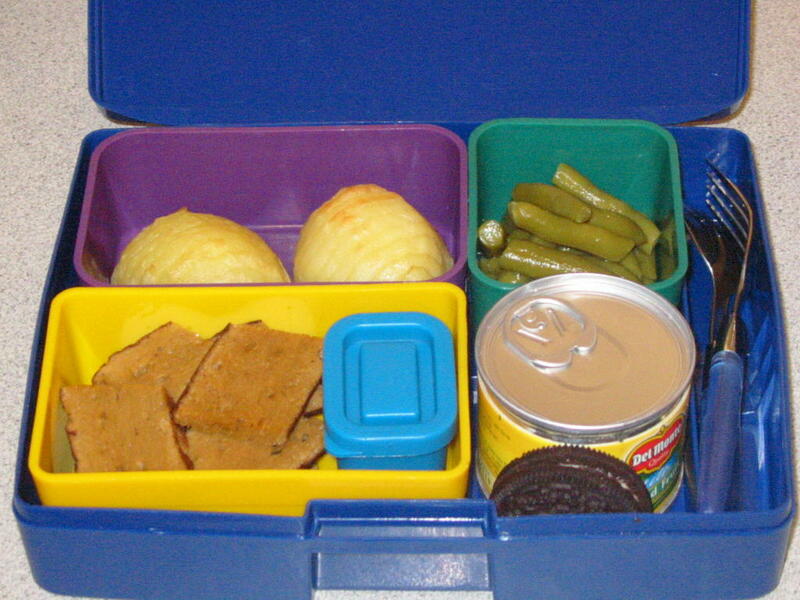 I packed them up with smoked almond rice crackers, easy potato salad (new potatoes, vegenaise, mustard, and capers), watermelon balls and grapes, and some whole wheat chocolate chip cookies. Verdict: Although I have doubts about the health-giving properties of vegan salami, it was quick and easy and he loved it. Sadly, he was playing with another boy at lunch and spilled most of his fruit salad. Only one bite of potato salad was left in his lunch box. 3 stars. 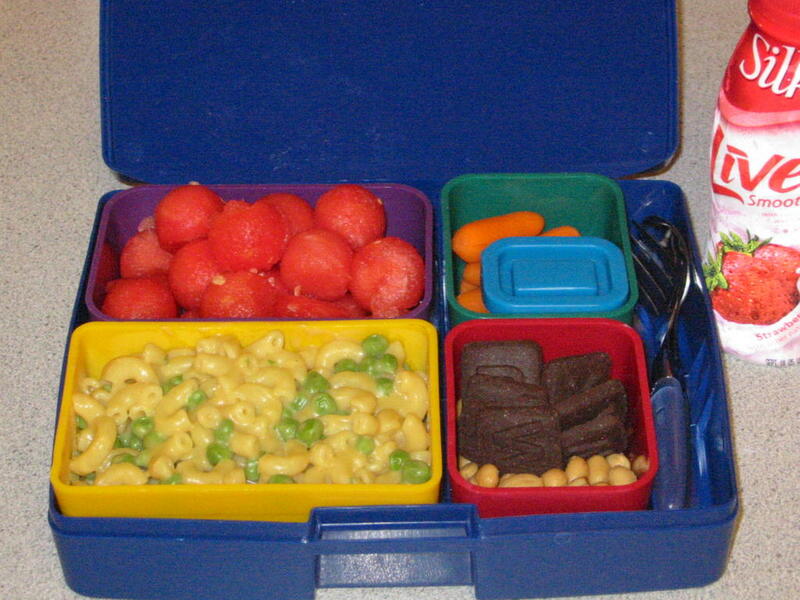 Macaroni & peas with "Amazing Mac 'N Cheez Sauce" (from The Ultimate Uncheese Cookbook by Jo Stepaniak), seedless watermelon balls, baby carrots with a little extra cheez sauce for dipping, roasted peanuts, and some chocolate alphabet cookies for dessert. Beverage: strawberry "Silk Alive" soy yogurt drink. Verdict: I knew I had a winner when he wanted to eat his lunch for breakfast. 5 stars. 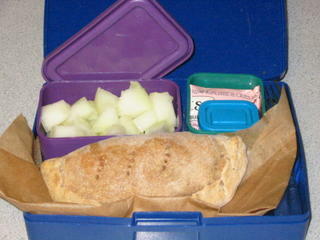 Here's my Little Shmoo's very first lunch on his very first day of 1st grade. 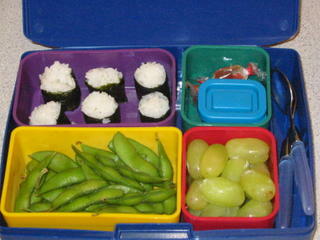 Per his request: vegan sushi rice wrapped in nori, a small container of soy sauce, edamame (baby soybeans), and organic grapes. I snuck in some Botan Rice Candy for a treat. Beverage (not pictured): raspberry "Silk Alive" soy yogurt drink. Verdict: didn't have time to finish all the edamame, but ate them as a snack after school. 4 stars.